A modern spot for your holidays, located in Sitio da Nazare (Nazare top historical part), at Praia do Norte (North Beach canyon) road in a prime residential area, 5 min from every main places. You will also have access to a support kitchenette where you also will have free tea, coffee, muffins, milk and fruit, during your stay with us. Or if you rent an apartment, you will have your own full kitchen and a living room just to yourself. All our rooms and apartments are decorated differently in-line with boutique design, making every room unique. We offer full commodities of an Hotel featuring, Air Conditioning / Heating / Free Private Parking / Wheelchair Ready / flat TV's/ Free Wireless Internet Access / Room Telephone / En-suite Private WC / Shared Garden with seating Area. Residencia Praia Norte - AL is located in a prime residential area, 5 min from the village crowded streets and a 5 min walk to everywhere. 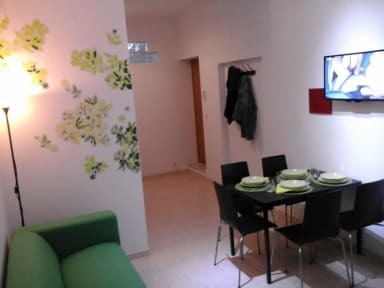 With sea views to Praia do Norte Beach (and a 10 min walk to Both Nazaré Beaches, the Square, the beautiful and outstanding Church of Nª Srª da Nazaré, Restaurants, Museum, Bullfight Arena, Funicular/mountain lift, Aqua-park, Horse Riding, Deer reservation, Cycling atlantic road, etc), with a private entrance, outside garden with sitting area and parking space, it will make your holidays in Nazaré relaxed and unforgettable. There are regular buses connecting Nazaré to Obidos, Caldas da Rainha, Alcobaça, Coimbra, Porto, Leiria and Lisbon. Check in from 14:30 to 21:30 . Smoking is only allowed in some of the public areas and some of the open air areas.